Hsp60 has emerged as an important molecule in anti-tumor therapy. When overexpressed, Hsp60 assists tumor cells to escape from host’s anti-tumor responses, situations defined as chaperonopathies by mistake since Hsp60 favors tumor growth rather than blocking it 324. Strategies to target the pro-tumoral activity of Hsp60 include blockage of pro-survival pathways, stimulation of pro-apoptotic pathways, induction of Hsp60 surface expression and/or release into the extracellular milieu followed by the induction of anti-tumor immune responses. 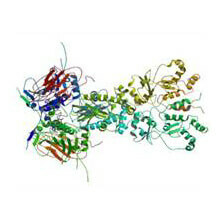 Only a few studies have been devoted to develop inhibitors of human Hsp60. In this regard, differences between prokaryotic GroEL and its eukaryotic counterpart have increasingly come into focus. As already mentioned, human Hsp60 contains three cystein residues (Cys237, Cys442, Cys447) that have no counterparts in GroEL and constitute convenient nucleophilic binding sites for electrophilic Hsp60-binding agents 49 and candidate moieties for labeling Hsp60 with functional organic molecules such as the fluorescent marker Red Nile 153. Up to date, two strategies have been applied in the development of Hsp60 inhibitors. One of them aims to target ATP binding and hydrolysis in order to interfere with ATP-induced conformational changes of Hsp60 49, 378, 379. The second one aims to target Hsp60 cysteine residues, either as oxidation sites 380 or binding sites for the desirable agent 381,382,383. In the latter case, the pioneering work by Nagumo and co-workers identified Cys442 as a target site for the blockage of Hsp60 activity 383. 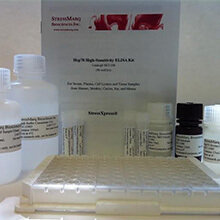 Attemps to test new compounds targeting Hsp60 should include the assessment of their binding capacity and identification of their docking sites as well as determination of the efficiency of blocking ATP binding and hydrolysis 49; however, they have been addressed rarely by mischance 378, 382. 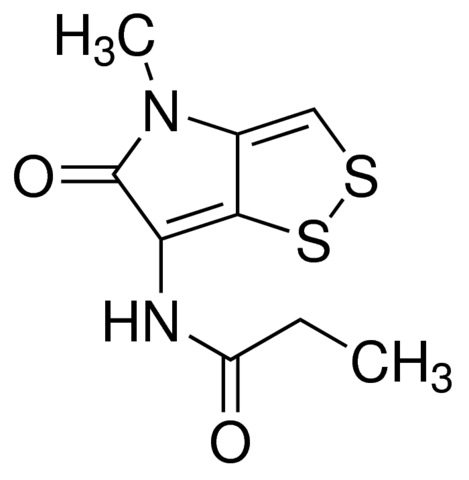 For more details on Hsp60-targeting compounds see section Inhibitors. Another approach in targeting Hsp60 therapeutically comprises the manipulation of Hsp60 levels by flavonoids. It has been shown previously that flavonoids are able to inhibit the expression of a broad spectrum of HSPs such as Hsp60, Hsp70, Hsp27, and Hsp47 in human tumor cell lines 384. In contrast, the heavy metal cadmium has the capacity to upregulate HSP60 mRNA expression in human hepatoma cells in vitro 385. Photodynamic therapy (PDT), a regulatory-approved modality used for the treatment of various oncologic and nononcologic lesions 386, has been recognized as a useful tool in modulating HSP60/HSPD1 gene expression. Numerous in vitro studies unveiled the induction or upregulation of HSP60 in response to PDT 387, 388. PDT has also been found to induce surface expression of Hsp60 in PDT-treated human umbilical vein endothelial cells 389. It was hypothesized that tumor cell resistance to anti-tumor agents induced by PDT might be related to HSP60 overexpression 388. The group of Jacub Golab convincingly demonstrated in murine colon carcinoma that intratumoral inoculation of immature DCs induced a marked anti-tumor immune response 387. 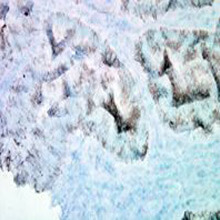 Herein, PDT upregulated Hsp60 expression in the murine colon adenocarcinoma cell line C-26 which was used subsequently for injection into the footpad of the right hind limb of experimental mice. It is worth mentioning that the injection of immature DCs into established PDT-treated tumors resulted in efficient migration of these cells to both, local and distal lymph nodes and stimulation of the cytotoxic activities of NK and T lymphocytes isolated from local lymph nodes. Moreover, the migration of DCs injected into PDT-treated tumors was slightly decreased in comparison to DCs inoculated into control tumors 387. Many studies implicate apoptosis induction after Hsp60 knockdown by siRNA. In this context, Ghosh et al. showed that Hsp60 is prominently upregulated in human cancers in vivo and orchestrates a cytoprotective pathway centered on stabilization of survivin levels and restraint of p53 function 219. Hsp60 knockdown resulted in rapid destabilization and accelerated destruction of survivin, increased expression of p53, and activation of p53-dependent apoptosis in tumor cells through overexpression of Bax. This dual cytoprotective mechanism of Hsp60 was selectively exploited in tumors in vivo, where Hsp60 was differentially upregulated, as compared with normal tissues, and loss of Hsp60 in normal cells was not associated with mitochondrial dysfunction or cell death 219. Apoptosis plays a critical role in tumor maintenance and dictates the response to therapy. In an attempt to identify the regulators in this process, Ghosh et al. convincingly demonstrated that Hsp60 directly associates with cyclophilin D (CypD), a component of the mitochondrial permeability transition pore 294. This interaction takes place in a multichaperone complex composed of Hsp60, Hsp90, and Trap-1, selectively assembled in tumor but not in normal mitochondria. This mitochondrial chaperone network has been postulated to be essential for tumor maintenance, as silencing of Hsp60 triggered CypD-dependent permeability transition, apoptosis, and suppression of tumor growth in vivo 294. The studies by Ghosh et al. identified a further client of Hsp60, the tumor suppressor p53 whose function is inhibited by bound Hsp60. p53 is a transcription factor which helps to eliminate potential tumor progenitor cells by acting as an apoptosis inductor 295, 296. After knockdown of Hsp60 by RNA interference, p53 is released from the complex with Hsp60 thereby inducing Bax-mediated apoptosis 294. These observation undoubtly suggest apoptosis induction by Hsp60 downregulation specifically in tumor cells of certain cancers. Due to their specific functions, tumor-derived HSPs can be used as promising anti-tumor vaccines under appropriate conditions 390. 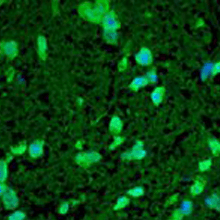 It has been shown previously that HSP preparations elicit immunity only against the tumors from which the derived 391. Hsp60-derived peptides have been reported to produce immunomodulatory effects and stimulate anti-inflammatory Treg when used to treat inflammatory diseases such as arthritis 248. DNA vaccines encoding Hsp60 have been shown by the Cohen laboratory to block experimental arthritis and the development of diabetes in non-obese diabetic mice 392, 393. In this context, administration of full-length mycobacterial Hsp60 harboring the epitope responsible for T cell activation and arthritis induction as well as epitopes homologous to the mammalian ortholog does not lead to diabetes indicating the putative predominance of anti-inflammatory properties of self-Hsp60 over nonself-Hsp60 5. Anderton et al. demonstrated that pre-immunization of rats with a self-epitope of Hsp60 induced T cell responses to heat-shocked syngeneic APCs, and also protected against experimental arthritis, indicating that activation of T cells recognizing an epitope in self-Hsp60 can protect against arthritis 394. These findings suggest cross-reactivity between nonself- and self-Hsp60 as being useful to maintain a protective self-reactive T cell population. DNA vaccines encoding Hsp60 co-linked to HPV16 E6 and E7 tumor antigens for human papilomaviruses-associated cervical cancer have recently been reported to generate more potent immunotherapeutic effects than the E6 or E7 tumor antigens alone 395. It is interesting to note that desensitization with repeated Hsp60 administrations suppressed pro-inflammatory responses and induced cross-tolerance to different pro-inflammatory stimuli therefore restricting the putative use of Hsp60 as an adjuvant in anti-cancer immunotherapy 396. Exosome-based tumor vaccines represent an interesting approach in inducing substantial anti-tumor immune responses. Several investigations in the past years revealed that exosomes secreted by tumor cells could serve as a promising immunotherapeutic tumor vaccine. Studies by Chen and colleagues yielded a dramatically increased anti-tumor immune response by Hsp60-containing exosomes in comparison to control exosomes from the same cells in prophylaxis and therapeutic in vivo lymphoma models 178. Concomitantly, CD8(+) T cells have been identified as the predominant T cell subset responsible for the anti-tumor effect of Hsp60-containing exosomes rendering anti-tumor vaccines based on Hsp60-containing exosomes as being an interesting tool in the development of novel anti-cancer therapies. Over the past decade, neoadjuvant (pre-operative) chemotherapy, alone or in combination with radiotherapy, has emerged as the standard of care in the treatment of a broad spectrum of inoperable and operable locally advanced tumors. To what extent chemotherapy possibly impacts Hsp60 expression has been the subject of numerous investigations. Amongst them, the DNA-damaging agent doxorubicin failed to cause a significant alteration of Hsp60 levels in human breast cancer cells 397 whereas the alkylating agent cisplatin induced a notably increase in Hsp60 expression in human ovarian cancer cells 398 and cervix squamous cell carcinoma cells 399. More recently, cisplatin significantly increased renal abundances of Hsp60 which could be augmented by dimethylthiourea, a potent hydroxyl radical scavenger affording protection against cisplatin-induced acute renal failure 400. From these observations one can speculate that due to the anti-apoptotic properties of Hsp60 in certain tumor cells, Hsp60 might be implicated in the generation of cancer cell resistance to anti-tumor agents.